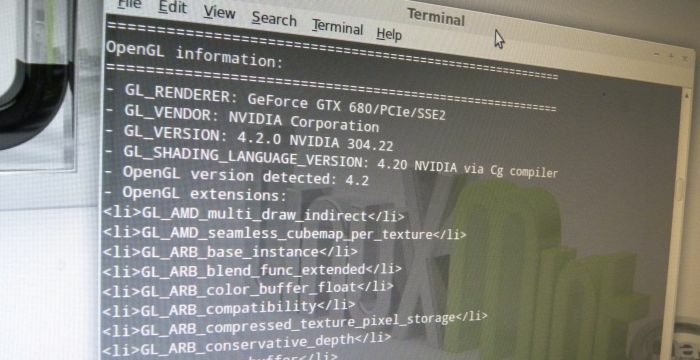 NVIDIA has published a new graphics driver for Linux that adds the support of GTX 680M as well as Quadro K1000M and K2000M. R304.22 comes with a bunch a new features (like the DKMS —Dynamic Kernel Module Support— support in nvidia-installer: installing the kernel module through DKMS allows the module to be rebuilt automatically when changing to a different Linux kernel) and several bugfixes. The complete changelog is available on the download page. I tested this driver under Linux Mint 13 with a GeForce GTX 680 (I followed this article to install the graphics driver: How to quickly Install NVIDIA R302.11 Drivers Under Linux Mint 13).